This year, to celebrate National Indigenous Peoples Day we asked the staff at Castlemain to share their reflections, memories, and images that celebrate the communities we work with. National Indigenous Peoples Day is an opportunity for everyone to learn about the cultural diversity of First Nations, Inuit and Métis peoples, and celebrate the culture, heritage and outstanding accomplishments. Castlemain’s Graham Wood defended his Capstone Project for the University of Victoria faculty today. 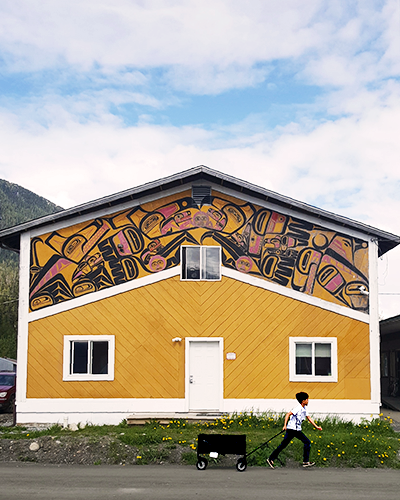 The MBA project was aimed at providing the Tahltan Band Council (TBC) with a sustainable framework for their newly created Housing Society to help meet community housing needs in and around Dease Lake, BC. Concurrently, Castlemain worked alongside M’Akola Group of Societies, BC Housing, Feddie Louie and Chief Rick McLean to assist TBC in acquiring 17 homes and securing funding for their long-needed renovations. The defence of Graham’s Capstone on Indigenous Peoples day, together with an announcement from BC Housing launching an Indigenous-specific housing program (read more) is serendipitous. On this Indigenous Peoples’ Day, we congratulate the Tahltan Nation and envision that this acquisition is a seed for the future and success in implementing a community-specific housing strategy centered on a distinctions-based approach. ‘A welcoming stay in Gitwinksihlkw, home of Hobiyee and the Gitwinksihlkw Lizards’! In February, I had the privilege of visiting the Village of Gitwinksihlkw, a Nisga’a Village in the Nass Valley. One of the highlights for me was the hospitality. 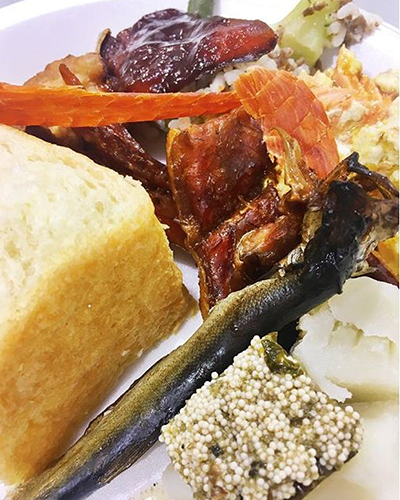 During our stay, we were invited to two feasts, where we were treated to incredible food, including wild salmon, oolichan and bannock. The warm food and care we received was greatly welcomed after a long drive in intense snowfall. During the community meeting we attended, we also participated in sending off the Men’s and Women’s Basketball Teams to the All Native Basketball Tournament in Prince Rupert. Go Gitwinksihlkw Lizards! Over the past 7 years I’ve been incredibly fortunate to have worked with dozens of communities on a wide range of meaningful projects. I will never forget a conversation that I had while working on a land use plan for the T-Sou-ke Nation. Our team was setting up for a community open house and I got into a conversation with Rob, the cook who was making dinner. He introduced himself and said “Come over here, I’d like to show you something.” I followed him to the window that overlooked a grassy area in front of the waters of the bay. He pointed at a Raven that was sitting silently on a large boulder. “You see that Raven over there?” he asked. “Yes, of course” I responded. “Well that raven finds a mate for life, and it will wait forever in this place for that mate to come back. I want to know that you and your team are like that raven, in that you will be loyal to our community, and not disappear like all the consultants that have come before you, leaving us with less than was promised.” I stood silently as his message sank in. Eventually I replied that “yes, I give you my word that we will do everything we possibly can to ensure you that the work we do is of value to your community, and that we will not disappear if things get tough” recognizing the trust that he and the community put in us. I am proud to say that years later our team is still working with the T’Sou-ke Nation to help plan and implement their land and economic development goals. Celebrating leadership – both past and present. 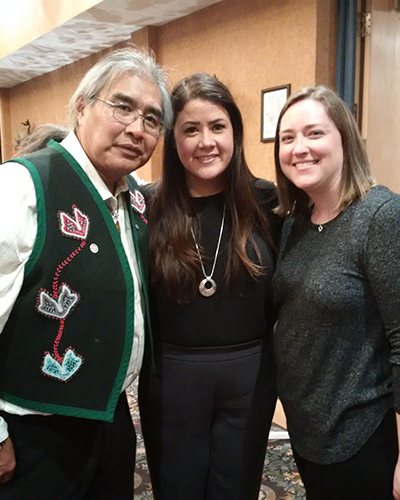 Photo is former Regional Chief Eric Morris and current Regional Chief Kluane Adamek – Assembly of First Nations – Yukon Region. We were invited to attend the 2018 Special Assembly of the Nisga’a Nation in Gingolx, BC in May, and I felt so fortunate not just to be welcomed into the community gatherings, but also for the opportunity to experience such a beautiful and pristine place. From the warm and welcoming hospitality, to the incredible scenery, the whole trip is something I won’t forget.